The children always come first in any parents life or you would like to think so. Due to our living arrangements our children don’t get to spend a lot of time together. When they are together what rules apply? Do they live my my rules, my partner (when at his house)? 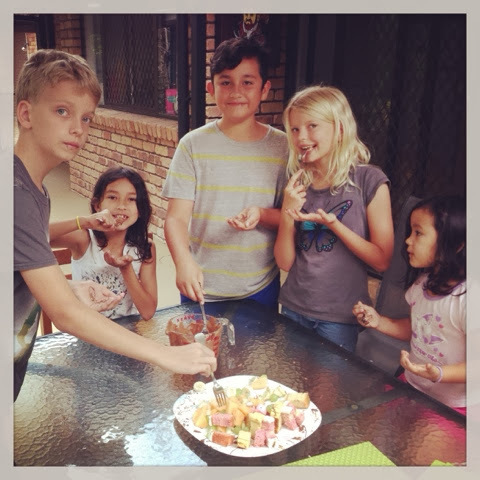 Fruit and melted chocolate for morning tea. What happens when those children are not yours? Do your rules apply? These are some of the questions parents in blended families must answer. How would you answer them? How would you judge someone else if their answers didn’t match your own? What if that person was your partner? There are no right or wrong, black or white. A carefully negotiated mind field to ensure everyone’s needs are met equally. Which can be impossible all at the same time and is not unique to blended families. My partner loves giving the children chocolate for morning or afternoon tea. I don’t agree this is suitable for young children. Can a compromise be chocolate covered fruit?